As you have no doubt heard, a Caribbean vibe is all over the American pop landscape these days, thanks to stars like Drake (“One Dance”), Major Lazer (everything), Justin Bieber (“Sorry”), and Sia (“Cheap Thrills,” featuring Sean Paul himself). But the heart of the sound doesn’t belong to dancehall, although that’s there, too, and it certainly doesn’t belong to tropical house, as you might have read to your dismay. It belongs to soca, the pumped-up, blissed-out sound that was birthed in Trinidad some 30-odd years ago and has long been the Caribbean’s—and the Caribbean diaspora’s—favorite soundtrack to carnival. If any one person can be called responsible for soca’s growth, it’s the 41-year-old Montano, who, even before his now-decades-long reign, was soca’s prince, having started singing at seven and made a name for himself by 11. Go to a soca fete, picked at random, and you’ll hear a Montano song, and usually more than one. 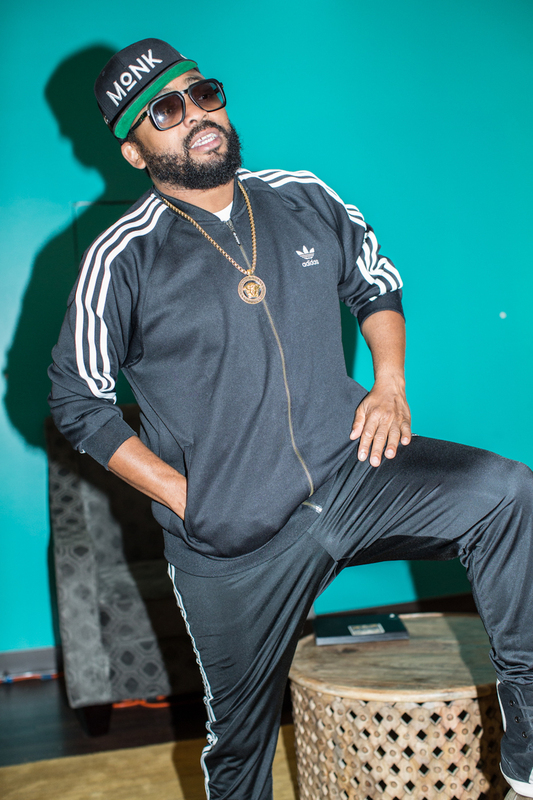 There’s his latest synth-rush hit, “Waiting on the Stage,” off 2016’s Monk Evolution, an album that contains half a dozen legitimate bangers; and his previous synth-rush hit, “Like Ah Boss,” which produces as much “joy power”—Montano’s term for soca’s effect on the listener—as six of whatever your favorite pop smash is. Then there’s perhaps his biggest track, “One More Time,” which has prompted innumerable plaintive, rum-fueled singalongs since its release in 2007. Montano is known for his charm, stage presence, and a work ethic that finds him up at all hours rethinking his persona and calling in collaborators—everyone from soca queen Alison Hinds to hip-hop aristocracy like Busta Rhymes. This summer alone he’s hooked up with Major Lazer, with whom he jumped onstage at Coachella, and Drake, whose OVO Fest in Toronto he opened, and Lauryn Hill, whom he joined on her Diaspora Calling! tour. He also played at the White House and opened his first movie, Bazodee, in August. I met Machel in New York City, just after he got in from a trip to Kenya and just before his big Labor Day/Carnival weekend concert at Coney Island. Noisey: How were your travels? 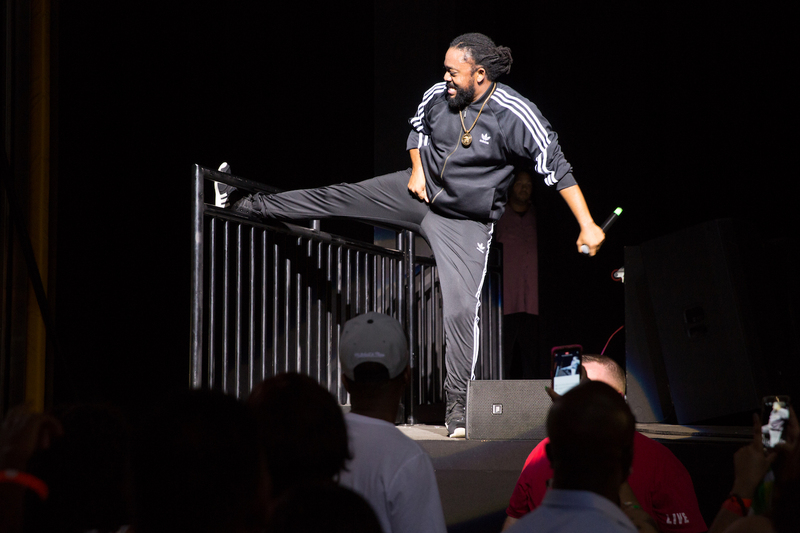 Machel Montano: It was surreal. Pulling up on a leopard, which is pretty rare. We saw two of them. It was a very spiritual moment. To roll up on them quietly—they should be rolling up on us. But the joy of the moment, it was so natural, just being there and being there in the car out in the vastness, you looking for something and then finding something deep like that. You hear a lot more about soca in the mainstream here in the US now, but there are also spots in the Caribbean it’s just starting to hit? Other places in the Caribbean. The young people want to travel, and they do a lot of inter-tourism, not too far and wide, going to Barbados if they’re from Trinidad, or they’re going to Jamaica. They choose to go during carnival week, so there’s partying, people traveling, almost like Woodstock from island to island. There’s also this music, this soca music, that’s being shared across this community as they move. There’s the culture of playing Mas, sometimes playing Jouvert, dressing in oil and paint, people trying that out for the first time. In Trinidad they have the paint and the powder and the mud. They’re trying that out for the first time. So it’s kind of like a revival of the music, but it’s coming with these kind of things to do that they’ve never really had. They never had a water fete at six in the morning in Belize. Now they’re having one. It’s because they came to Trinidad, they saw it, they’re adopting that. It’s the fuel we need. It’s like solar power. Humans need joy power. We’ve become numb to the news every day. To a mass shooting in a cinema somewhere. So we just reached that point where we will gravitate to the things that will lift our spirits more. At one point in time heavy metal and thrash metal were the way people wanted to describe their emotions, some people. I think this is more a time of spiritual upliftment. Soca music is very much like that. Soca is about uniting and mixing African and Indian beats and riding on the similarities. So you’re gonna find, which is already happening, a lot of hip-hop producers taking the swing of the beat and putting it in their hip-hop, a lot of Indian people putting it in Indian music. But it’s that one beat. One of my favorite things about soca and the emotions behind it is that there’s this hint of melancholy behind some of the celebration a bit, like in “Cheers to Life” or “Human” It’s not just a call to celebrate by getting trashed and passing out. Part of its creation—the people behind soca, like Ras Shorty I, he was trying to change his life. And there have been some songs in recent times talking about “wining by myself” and “I don’t need anybody, and if you see me for carnival, man, don’t go bother me, I’m just drinking my rum.” I’ve tried since 2005 to write more soca songs about personal feelings and emotions. Songs like “We Not Giving Up” with Doug E. Fresh, about me really wanting to give up but seeing the kids everyday not giving up. Sometimes you would get this sadness coming out because there are times—and I’m one who knows this—where carnival you’ll be in the middle of a million people in the street. What was going on that prompted that change in 2005? For me I call it molting. I’m always molting. After three years I always want a new skin. I always feel tight. And you want to expand. In 2005, I worked that year with Wyclef in Wyclef’s studio. Being in New York reminds me of that. Meeting Wyclef for the first time. He was jamming a soca track, and we thought we could work on some of those together. It was a time when we stopped in the studio and worked on a lot. But just for me, I was kind of wanting to give up where we were. We were a young band when we started. I had friends, and we became a 13-piece orchestra. We had horns, and background singers, and two guitarists, and two keyboard players, and then I just thought the band had to become a five-piece band. We had to come down to a five-piece format. Like U2 or a Coldplay. Try to write soca from that point of view. So I started to make simpler songs. “One More Time” came out in 2006. A banner year. But we still had to fit ourselves in the box of carnival and success. The box of carnival and success. The box of touring and the whole circuit and the diaspora. That is probably sometimes the catch-22. The cry on one side of it, which is in 2005, is, “How do I break this glass ceiling and make this international music? OK, I’ll try this, and I’ll work really hard.” And sometimes you work so hard, you don’t break the glass ceiling of international success, but you change the course of the local market. You push it forward. So it seems like that’s actually led to renewed success for you, because the last few years, at least to me, seems like they’ve been getting bigger and bigger for you—the Major Lazer stuff, for instance. A lot of it was that theory of less is more. Machel Montano HD: clearer picture, slim it down. We’re not just searching for hit songs. You’re leaving the old city behind to go in the new city. You have to build the bridge, you have to cross it, and then you have to take people from the old city into the new city. I’ve seen interviews you’ve given where you talk about the global sound. Is that what you want? Or to be a pop star? The vision is not necessarily to be a pop star, because I had many visions of that life. It’s not the prettiest life. You might slip a couple lines, you know, get a couple gifts, see a couple of pretty interesting, awesome things. But the feeling I’m looking for is more closed-eye, on a stage, with the right sound, of a beat, that’s making me dance a certain way, that I don’t have really open my eyes. You talk about the Bieber song and these soca-influenced things you hear on the radio these days. Does it matter to you that people know they’re listening to soca, or are you happy for them to get the soca feeling even if they don’t know it’s soca? Do you dread carnival season coming? Is it ever too much? That voice is always there. There’s always the voice going “Ahhhh, it’s coming.” You hear that voice around September—[phone rings] gimme one second. Yes mother? How are you? I’m in an interview. What’s up? OK, cool, thanks. Bye. I answer whenever she call me, my mom. Where were we? Carnival time—do you dread it? What is your average carnival day? I’m always realizing just the dread of it will put me in such good shape. I’ll lose 35 pounds in a month, two months going into carnival, top shape of my life. I’ll be going to the gym 2:30 every morning. I’ll usually get sometimes two hours sleep a day, maybe three if lucky. It is a day of rehearsal and timelines and deadlines. It’s tough, it’s not an easy situation because there’s so many shows. I’ll do 50 shows in two months. And I will master the show on probably number 46. On the 46th show I’ll be happy. Then I’ll get like four shows the way I want it to be—flying, that energy. And sometimes I want to see these shows happening not in the night, not in the fetes, not where it’s just about alcohol, food, bar, toilets. I want it to be somewhere where it’s about community, about the trees, about the sea, about our relationship—I just want the shift that I dream of. But it’s not something you can just go over there and see it and take people there. What’s your favorite carnival memory? Oh wow. Probably winning Trinidad Road March with a song called “Jumbie.” This was probably in ’06, ’07. They judge the Road March competition by the song that gets played the most during carnival on the road crossing the stage. It’s always about writing a song to lift people’s spirit. To gain the joy of all the people. To win over all the hearts. We were in the streets during carnival time, and the song would play hundreds of times. People would come up to you, they’re going in, out, into each other’s spirit, kissing each other. It’s almost like fencing, like swordplay, this thing, like souls playing with each other. I’ll never forget that year. You could walk into any store, and they’d give you whatever you want for free. Food, drinks, whatever. It was so funny when you’re that present, that omnipresent. The most amount of people in the country know you at that one time. It’s a happy feeling. Everybody’s hand would be up in the air. You would see them in exult, in excelsis deo. How were the Drake and Lauryn Hill shows? Always awesome. 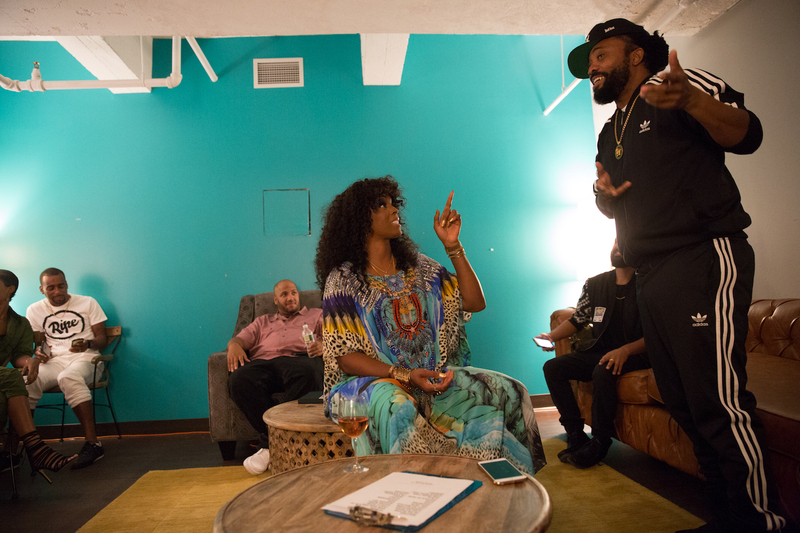 We did Lauryn Hill at King’s Theater. It was magical for me to stand and see what she was doing. She’s putting all of us on her shoulders: herself, me, Mr. Eazi from Africa, Wondaboy from Africa, the Jamaicans, Stephen Marley. The same experience was at the Drake OVO soca show. OVO was starting to become a huge presence during Caribana time. I would go to Toronto, and I would always marvel. Toronto’s smaller than New York, and the kind of recognition the Caribbean community gets in mainstream media in Toronto is always a joy for me. It will be the main news channel talking about “Yes and we have Caribana today, and the Trinidad masqueraders,” and you’ll go, “Yeah, they’re talking about us.” In New York you could go the whole Labor Day weekend and probably not see it on Fox, ABC, whatever. To see Drake reach out and embrace, not just on his records, but the fact that, “Yo, hey, I respect the soca community, let’s embrace this into OVO.” Because OVO is slowly becoming something because of his rise and what he has done for his city and their sound. It’s faintly the same thing with soca music and my experience coming up. I know all of these people came up not liking it who are loving it now. When I started singing calypso, I was loved from the get-go but always by people older than me. They were amazed at this little boy who could do this adult thing. It’s like when they see Michael Jackson dance, or James Brown. Then one day I wanted to know where my peers were. I went to my parents, and I was like “Ok, let’s go to this club where they have a talent show.” It was a bunch of young people in the club lip-syncing to Bell Biv Devoe, dancing to pop songs or breakbeats. There was nobody singing calypso. I started singing, and I was basically booed. People turned their backs. They didn’t like it. So that was a moment for me that I realized that I had to revolutionize soca—that this was an opportunity. Because I could see it being fun, and being hip. I was kind of like, “Do I sing R&B and reggae, or do I fix the soca thing and do my own thing?” Part of you wanted to jump ship, but part of you wanted to say no, and that’s when I think I found my purpose. This pride for your culture, that maybe your contemporaries didn’t have at the time, where did that come from? Photos by Cheney Orr. Follow him on Instagram. Daniel Kagan-Kans is a writer based in New York. Follow him on Twitter.